Have you been to Macau? I was there a few years ago and I love the place – especially the food (to be honest, food is always the main focus whenever I’m travelling, hah!) The egg tarts, Serradura, pork chop buns… mmm! 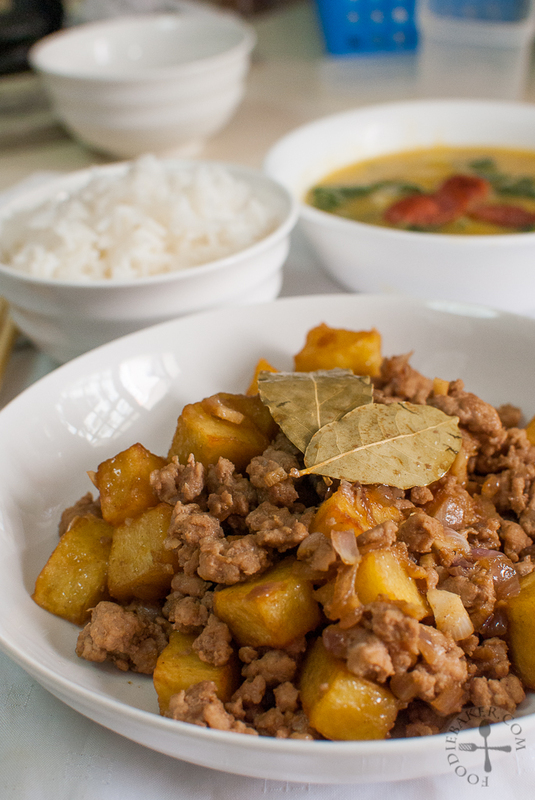 Macanese cuisine consists a blend of Chinese and Portuguese cuisines, with the addition of spices and seasonings into local Chinese ingredients. To put it simply, it is East meets West. 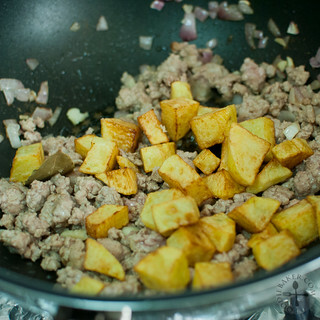 This plate of comfort food is made by sautéing onion, garlic and pork together. 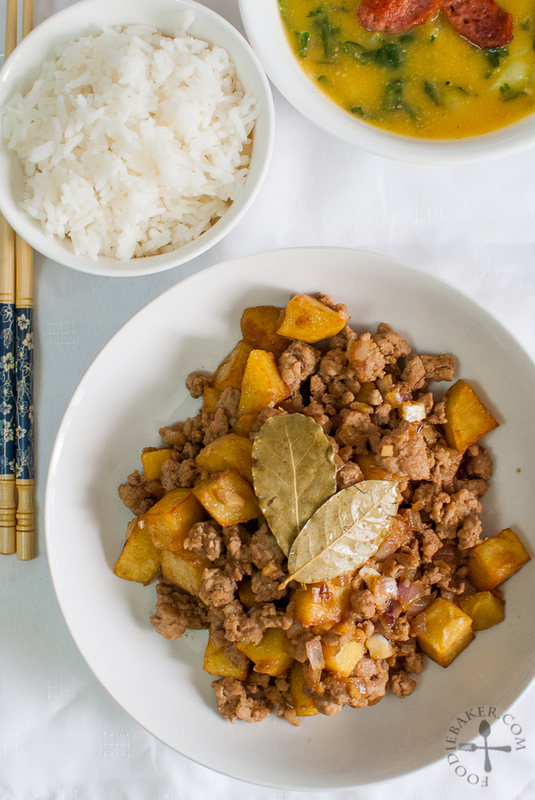 Bay leaves, cumin and deep-fried potatoes are added before seasoned with soy sauce and molasses. 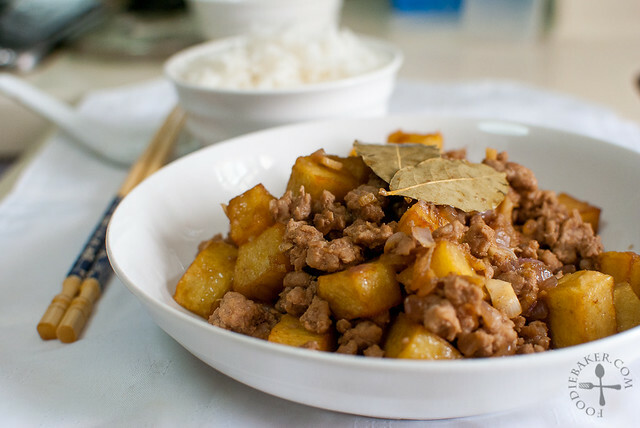 It is actually very similar to the one my mom cooks quite often, just that my mom’s version is has more potato (lesser meat) and doesn’t have cumin and bay leaves. It goes very well with a bowl of steaming white rice. If you are not a fan of cumin, use lesser or omit it. I omitted the molasses as I don’t have it on hand. This dish is made for the Asian Food Fest: Hong Kong + Macau hosted by Annie from Annielicious Food. I’ve originally wanted to make egg tarts but time doesn’t really permit me to do so, so I switched to this quick and easy dish, perfect for a quick weekday meal. Let’s start making this simple and easy dish! 1) Peel and dice the potato. 2) Deep-fry until golden-brown. 3) Drain and set aside. 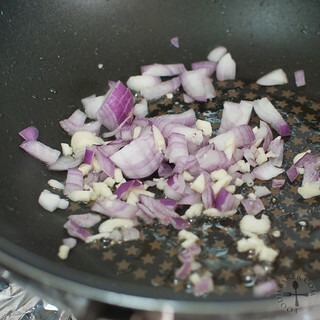 4) Sauté onion and garlic until fragrant. 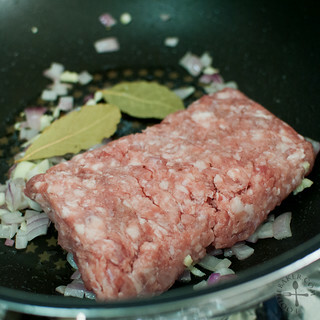 5) Add in pork and bay leaves. 6) Sprinkle the cumin. 7) Add in potato dices. 8) Add in soy sauce and simmer till done. Serve with a bowl of steaming white rice! I’m submitting this post to Asian Food Fest: Hong Kong + Macau , hosted by Annie from Annielicious Food. Head over to Annie’s post to see all the submissions thus far! Heat a pot with oil. 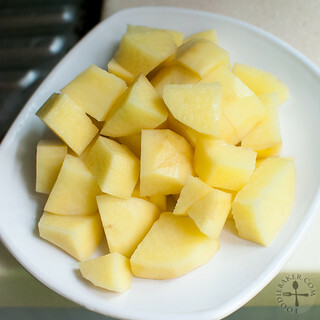 Dry the diced potato with paper towels. 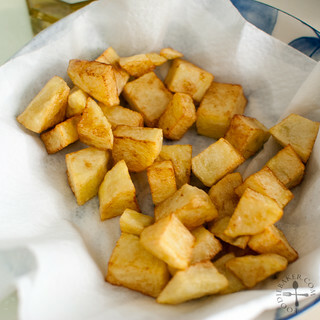 When the oil is hot enough, add in the diced potato and fry until the potato dices are golden-brown in colour. 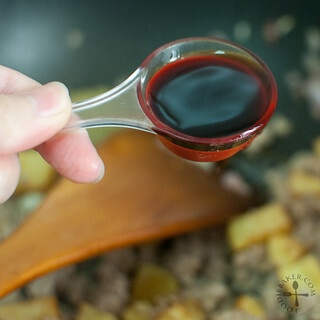 Remove from a slotted spoon and transfer to paper towels to drain the excess oil. Set aside. 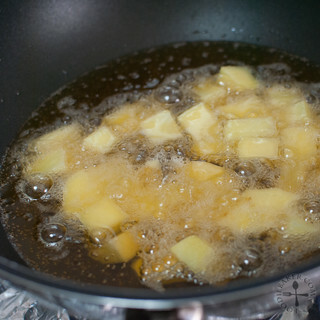 Heat 2 to 3 tablespoons of oil in a frying pan over medium heat. Add in onion and garlic and sauté until onion is translucent and the mixture is fragrant. Add in the meat and bay leaves, breaking up the meat and sauté until almost all the meat is no longer pink in colour. Sprinkle the cumin over the meat, add in the potato dices and the soy sauce. Simmer for another 2 to 3 minutes then transfer to a serving plate. This dish serves 3 to 4 people if you serve it with other side dishes. In Chinese cuisine, we often prepare a few dishes to go with rice – often a meat, a vegetable and a soup dish – for every meal. As such, this amount of meat will be enough to feed 3 to 4 people if sides dishes are prepared. 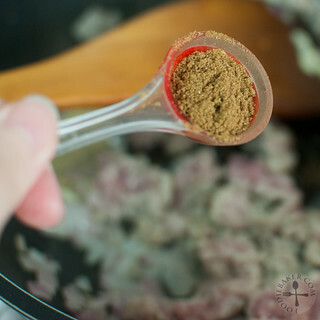 When adding the seasoning, go easy – using only 1/2 of what is stated in the recipe and adjust accordingly to suit your taste. I’ve never been to Macau but my husband was and he was fascinated by this country. Your recipe looks amazingly tasty and is easy to prepare. Every time I go to Hong Kong I try and go to Macau but haven’t made it over there yet. I can’t wait to eat all the delicious food, especially their egg tarts. This dish looks fantastic! It’s total comfort in a bowl and yes, you’re right, absolutely perfect to eat with white rice. I love your step by step photos too. That looks like a nice and easy dish, perfect for the busy day. Love this recipe! Very simple to cook, yet looks so delicious! I am too busy with and baking cookies to cook lol! Gong Xi Fa Cai to you! Very simple yet delicious dish!